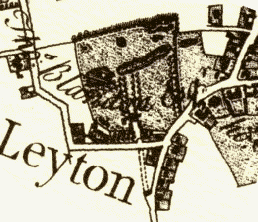 Here is a map made by Chapman and Andre in 1777 by which time the Grange was the home of Thomas Blayden (also spelled Bladen). The avenues of trees are further reduced. The ornamental lakes have slightly looser shapes (contrast with page 3). A naturalistic shape of ornamental lakes, pools and waterways was introduced at Stowe towards the middle of the 18th century, as can be seen in the photo below, but the change in Leyton Grange’s lake may just have resulted from less scrupulous maintenance.